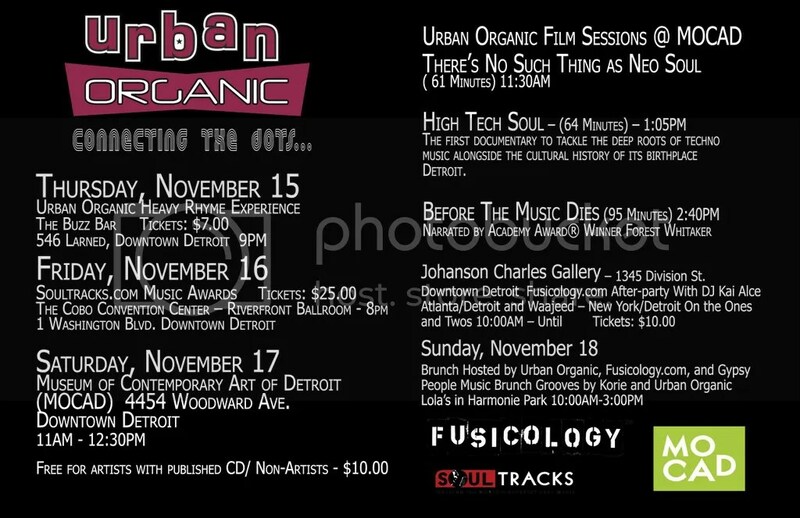 Fusicology is proud to participate as media sponsor in this year’s 6th Annual Urban Organic Festival downtown Detroit , November 15 – 18. This soul summit of sorts kicks off with performances from renowned & emerging soul & hip hop artists such as Amp Fiddler, Alison Crockett, Monica Blaire, Anthony David, Waajeed and many more. The weekend is set to climax with an all-star local jam with legend Roy Ayers, as we attempt to “connect the dots” between our seemingly disparate genres of “soul” music. The festival also features workshops and panel discussions for independent industry activists, as well as an indy music film showcase. Travel & hotel discounts for 2007 festival-goers! Detail below.. Anticipation mounts for the 4-day weekend in the D, with the Heavy Rhyme Experience kicking off the fest on 11.15, and the first-ever Annual Readers Choice Soul Track Awards on 11.16 hosted by SoulTracks.com & JodinesCorner.com. Awards will be given in several categories, with performances from over a dozen of our favorite rising Soul stars! A weekend not to be missed. Detroit Urban Organic Festival announces travel discounts for out-of-town UO Fest-goers! All discounts apply to travel / accommodations on the following dates: Tuesday, November 13 – Tuesday, November 20. Reservations must be made via phone. Northwest Airlines is offering 10% off your airfare one-way or round trip to Detroit Metro. CODE: NMC25. Amtrak Railways is offering 10% off any class train ticket on-way or round-trip to Detroit (Baltimore St. Station, across from St. Regis Hotel). CODE: X70Q-925. Hotel St. Regis – New Center, Detroit is offering $99/night room rate (50% off!) + other discount options. CODE: Urban Organic Festival.